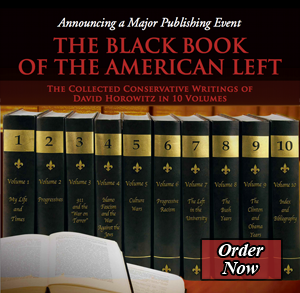 Volume III: the Great Betrayal, the latest installment of David Horowitz’s Black Book of the American Left (Second Thought Books, 2014), does what George Bush wouldn’t do: defend himself from a personalized left-wing onslaught. Horowitz’s book provides an understanding of the order of battle the Left used during the Bush administration to delegitimize Bush’s foreign policy and ultimately destroy Bush’s brand, and why it happened. How this happened, and Bush’s ineffective response, isn’t just a nostalgic journey through the last decade. Bush’s ineffective response to the Left holds lessons for the incoming Republican congressional majority as well as GOP White House hopefuls who will face the same progressive buzzsaw. But the Great Betrayal also has tough lessons for American voters. Modern political debate isn’t conducted between two camps seeking the same goals through different means. It is a debate between two wholly opposed worldviews, and if Americans fail to realize the true nature of the Left, liberty is threatened. Will voters support candidates who understand this, or pick yet another nominee for President who seems not to understand? As President Bush fought wars against Islamic terror from 2003-2009, first the institutional Left, and then the institutional Democratic Party fought a rhetorical war of destruction against Bush. “Yet the president has blundered in one particular way that cannot be attributed to internal foes,” Horowitz writes. “He has failed to sell the war adequately to the American people, and to answer the charges coming from his left flank. In the presidential television debates, for example, he chided Senator Kerry for saying the war in Iraq was the wrong war in the wrong place at the wrong time. ‘This confuses people,’ the President said. It does more than that,” Horowitz chides. Here we see classic Bush-clan caution with language. Deflecting Kerry’s charge with kind prose might be appropriate at the Kennebunk River Club, but in the modern national debate, something sharper is required. I encountered the same public relations strategy when I worked at the Justice Department during the Bush administration. One favorite tactic included – Responding to the attack will just prolong the story. That approach obviously failed because ten years later the story that President Bush was a failure is still going strong. Another tactic was – Responding will just lend legitimacy to the story. The Bush administration failed to understand that the media environment was transforming in fundamental and permanent ways. The attack by a left-wing blog, purportedly not worthy of response, became a headline in the New York Times months later. Narrative was germinating amongst the activists on the far left, implanting among the many new left-wing blog sites, and eventually reaching full maturity in the papers and network media the Bush administration took seriously. Instead of confronting the leftist narrative in the seemingly outlandish blogosphere, the Bush administration allowed the attacks to mature unimpaired. What’s worse, when the attacks matured, as it did with Senator Kerry’s attack, Camp Bush seemed more comfortable debating intellectual points than responding with a mighty rhetorical fist in the nose. The history described in the Great Betrayal is particularly relevant over the next two years. Many in the Republican Party, particularly in Congressional leadership, seem not to understand the Left’s order of battle. Instead of recognizing the power of the new conservative media, they still seem to care what the New York Timessays. Instead of recognizing the malignant pedigree of the current gang governing in Washington, some still use rhetorical slogans from a vanished time, such as making Washington “work” or “finding common ground.” Many in the GOP fully understand the new media battlespace and the genuine radicalism of the modern Democratic Party. Unfortunately, not everyone does, and the Great Betrayal documents the unashamedly radical anti-constitutional core of the modern Democrats. The Great Betrayal makes it clear that something more than differences of opinion characterize the dispute between left and right. Congressman Ron Dellums provides one example of many contained in the book. Horowitz takes readers back to the Reagan administration, when a communist regime, with Soviet oversight, was elongating runways on the Caribbean island of Grenada. The threat of a new Soviet client state able to launch bomber and fighter forces so close to America was too much for President Ronald Reagan. American military forces in 1983 invaded and extinguished the threat. The emissary for these pro-communist efforts to undermine America? Current Congresswoman Barbara Lee (D-CA). “Another document liberated by the Marines contained the minutes of a Politburo meeting attended by the Communist dictator and his military command. ‘Barbara Lee is here presently and has brought with her a report on the international airport that was done by Ron Dellums. They have requested that we look at the document and suggest any changes we deem necessary. They will be willing to make the changes,’” records the Great Betrayal. There is no common ground to be found with someone like Barbara Lee. There is no language too strong to condemn the Left’s open collusion with the enemies of America, whether in 1983, 2004 or in the years ahead. Dellums’ collusion with America’s enemies served as a taste of what was to come. Horowitz notes Dellums was “the first Sixties radical to penetrate the political mainstream.” After colluding with the communist enemies of America, Dellums went on to serve as Chairman of the House Armed Services Committee, complete with the requisite security clearances. I would submit it is even worse. There is now a clear and undeniable correlation between secular hostility toward religion and political ideology, excluding the small Muslim population in the United States. Those who tend to believe (or respect) in universal religious truths, tend to be on the right side of the spectrum. Those who demean, attack and deny universal religious truths tend to be leftists. Because America was founded on universal truths regarding the dignity of man, our nation is in the crosshairs domestically, and around the world. Horowitz can decode the left in ways natural Republicans cannot. He was of the left. What are unrecognizable sounds to Republicans are familiar melodies from Horowitz’s youth. The Great Betrayal examines the unbroken pedigree of the modern Left, the radical Islamists, those who drove the anti-Bush narrative of the last decade, and the Soviet apologists of a generation ago. Unless conservatives, constitutionalists, and American voters understand what Horowitz describes in the Great Betrayal, a timid approach to this threat may produce disasters anew we can’t yet contemplate.